While those trapped in the fighting zone in eastern Ukraine are trying to evacuate to safer areas, RT spoke to those who couldn’t leave the war zone soon enough to save their loved ones. Vladimir Bobrishev came to the ruins of his house in Donetsk to film on his phone what’s left of the life he had, before shelling killed his four-year-old son Artyom. His wife Tamara lost her right leg in the same attack, but that’s nothing compared to the nightmare of constantly replaying in her head the day she lost her child. Bobrishev’s older son, 7-year-old Misha, narrowly escaped death, when the rockets started falling in the area they lived. One of them hit Bobrishev’s house directly. A fragment of shell struck Misha in his face and body. After two operations, he says it doesn't hurt anymore. However, he needs further surgery, which can't be performed in Donetsk. A Russia-based international charity is now working to bring Misha to Moscow to get the help he needs. 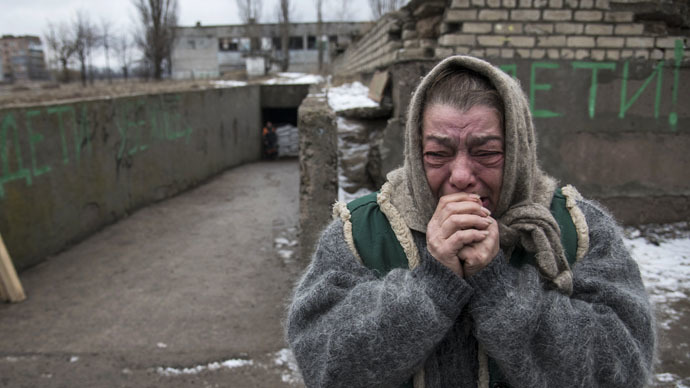 The civil war in eastern Ukraine has claimed at least 5,358 lives, according to the latest UN count. Human rights watchdogs have continuously urged both the troops and the rebels not to use indiscriminate weapons like multiple rocket launchers in close proximity to residential areas. Such actions violate rules of war because they make it practically impossible to avoid civilian casualties. In January, Kiev troops resumed their assault on rebel-held territories, sparking a new round of some of the most intense fighting since the conflict started last spring.